Cover Description: Superman leads the heroes of Earth into battle. 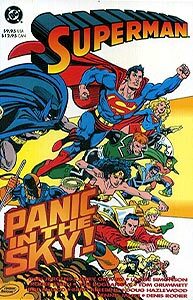 Issue Notes: This trade collection reprints the "Panic in the Sky!" story from Action Comics #674, 675, 676,Superman: Man of Steel #9, 10, 11, Adventures of Superman #488, 489, 490 and Superman #65, 66, 67. Issue Reprints: This TPB was reissued in 2016.